31 millions € – The project won a call for tenders and was entirely financed with private funds. The project Bardzour fosters sustainability and autonomy of La Reunion, by creating local and green streams for electricity generation & storage and for agricultural production, in line with Agrinergie® principles. Located in a prison, it also holds a social purpose, by promoting reinsertion through professional training. Bardzour solar farm is the first of its generation to include lithium ion battery storage with capacity of 9 MWh, a world first for this level of power when it began operations in 2014. This storage helps support the grid, thanks to stable and continuous electricity supply. 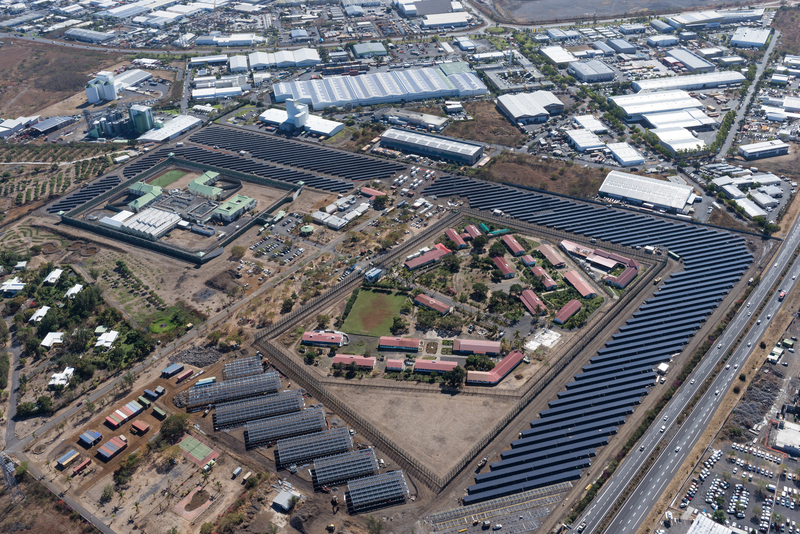 With total power of 9MWp, the project incorporates 8.4MWp of ground-based panels located in the no-man’s-land of the Detention Center in the village of Port, in the west of the island, and 0.6MWp installed on 6,000m₂ of Agrinergie® greenhouses. Bardzour has been involved in an ambitious prisoner rehabilitation program: during the construction phase, prisoners nearing the end of their sentences were trained to build photovoltaic units. 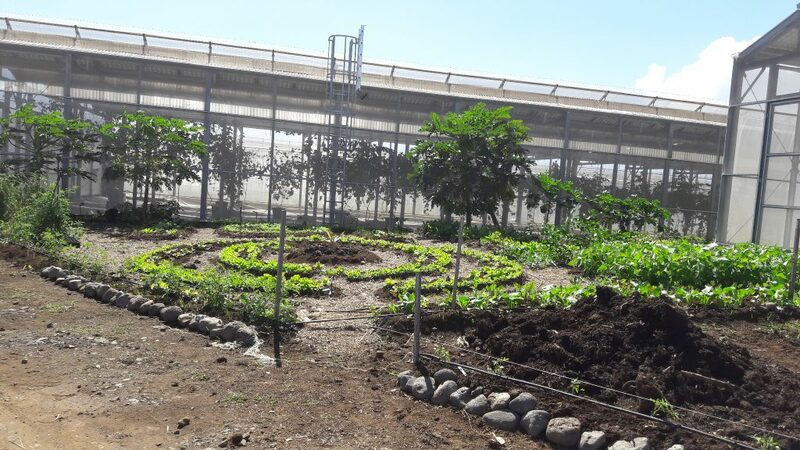 Agriterra, Akuo Energy’s agricultural partner, also continues to work with six prisoners on the site, training them in low-input horticulture in the Agrinergie® greenhouses. The produce from the project is sold on the local market, creating a short supply chain. 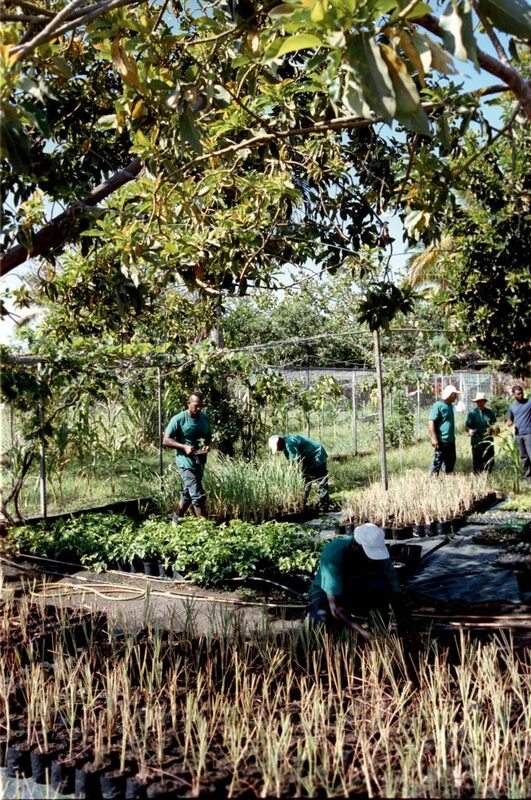 Permaculture techniques are used in certain key parts of the site, complementing the training received by prisoners. Training in beekeeping has also been provided for a dozen detainees, in partnership with Fondation Akuo. A 2-hectare arboretum of local and indigenous plants completes the set-up of this most unusual project. Bardzour has a strong public outreach as it is a flagship project for tomorrow’s energy and agriculture management. Bardzour was a prizewinner in the My Positive Impact campaign run by Fondation Nicolas Hulot in 2015, which brought a strong visibility and helped raise awareness about environmental issues and solutions for the future. The project was also selected to be one of the key features in Demain (“Tomorrow”), a documentary that presents a world tour of solutions to build tomorrow’s society, which made more than 1 million entries in France, was distributed in 27 countries, and won the Cesar of the best documentary. Agriterra maximizes local benefits by organizing trainings in permaculture for Reunionese farmers, one of which was animated by Charles-Hervé Gruyer, French specialist of permaculture. Moreover, local schools are regularly welcomed to sensitized children to the stakes of energy and agricultural production. The economic value-added of the farm lies in higher production of better quality in less land. Production is boosted by permacultural techniques, that provide higher yields per square meters, estimated at ten times more than conventional agriculture. Moreover, the products from permaculture are entirely organic, giving them a higher economic value. – The project has also implemented a 2-hectares arboretum gathering local and indigenous species. – Agriterra continues to train and work with 6 to 12 prisoners per year, to provide them with training to the agricultural techniques of tomorrow. The Mandala Garden is located outside the photovoltaic greenhouses. A Mandala, principle inspired from the Buddhism and Hinduism, represents the universe and therefore biodiversity. It is applied in permaculture as a recreation of natural inclusive ecosystems. Here, Agriterra experiments the techniques of permaculture under tropical conditions through this Mandala Garden, by associating different species that help one another to grow and protect each other from insects and diseases. The farmers are working on the plant nursery, whose production is dedicated to the photovoltaic greenhouses. These workers are both Agriterra employees, professional farmers, and detainees from the prison of Le Port, trained by Agriterra. Each year, Agriterra trains 6 to 12 prisoners nearing the end of their sentence to give them agricultural expertise on modern techniques respectful of the environment. Indeed, they find work more easily at their release, and can spread the practice of permacultural techniques.